عرض السلة “مجموعة المفكات من مانسمان (215 قطعة)” تم إضافته إلى سلة مشترياتك. 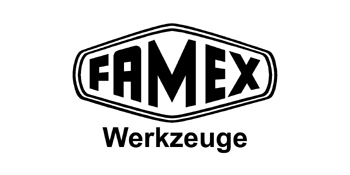 FAMEX is the hand tools brand of R. Lühdorff GmbH, a family-owned company founded in 1965. FAMEX supplies quality tools for commercial use and quality-conscious private users. The company is located in Remscheid, a town with a tradition of producing high-quality hand tools. The strength of FAMEX is to offer products of high quality and value for money. Test judgments in the trade press confirm the concept. 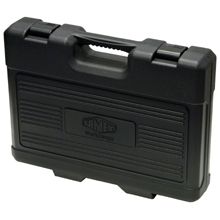 With the FAMEX tool case 145-FX-55 you get a well-thought-out tool case for work around the house. The sturdy case is compact, fits into any home and is therefore ideal for driving in the vehicle. The tools include a screwdriver, pliers, spirit level, hammer and a socket set. For better accessibility of fittings, the extension is equipped with a swivel system. This also works on the car, lawn mower or bike. 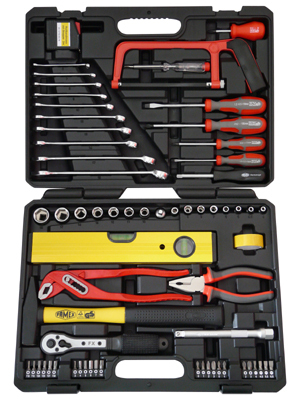 The case contains all essential tools for work around the house, as well as for small repairs on the car or bicycle. In addition to hammer, saw, tape measure, voltage tester and spirit level, the set includes a comprehensive range of screwdrivers. 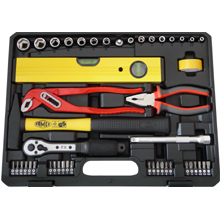 The handy tool case is also ideal for driving in the vehicle. The case is made of sturdy PE plastic and has particularly stable hinges and a robust closure system. 24 screw bits for Phillips, slotted, hexagon socket, as well as for Pozidriv and Torx screws. The screw bits can be used with the ratchet as well as with the screwdriver handle. All screwdrivers are made of chrome vanadium steel and hardened. The sockets are chrome-plated over nickel. The socket wrench extension has a 2-stage swivel system, so even unfavorable screws can be reached at an angle of up to approx. 10 °. Fully attached, the tools sit rigidly as on a fixed extension. 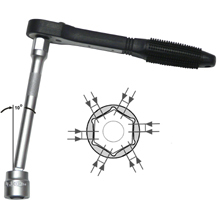 The socket wrench inserts have Flanc-Drive profile to protect the hexagon socket. The water pump pliers are 6-way adjustable and grip workpieces up to 40mm thick. Your duchgestecktes joint is guided on two sides and has a clamping protection, which protects the fingers when slipping off the workpiece. The combination pliers have pleasant handles with 2-component system, the locksmith hammer a glass fiber handle with plastic handle. 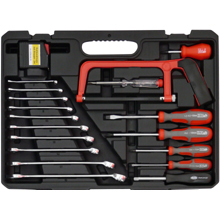 In addition, the set includes 4 screwdrivers with 2-component grips that make screwing much easier.